Our cleaning powder cleans rugs, carpets, upholstery, fabrics without leaving a residue, removes tough stain like blood and Kool-Aid, and removes crayon from walls and even melted crayon from fabrics. Use to clean your oven barbeque grill, to remove hard water spots from windows and yet it’s gentle enough to use for fine washables. 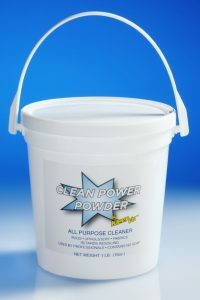 Clean Power All Purpose Cleaning Powder is non-toxic, biodegradable, non-corrosive, non-abrasive, and contains NO soap. This product is used by many professional cleaning services to get out the toughest stains.